← Aunt Anne is RIGHT! 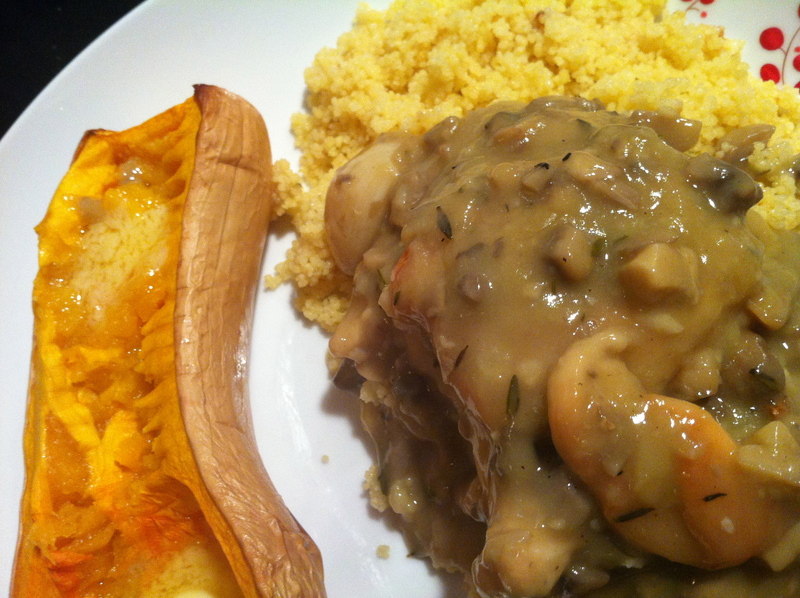 For dinner tonight I made Ina Garten’s Chicken with Wild Mushrooms… but with button mushrooms, not wild. No. I don’t count that as a real substitution. Nuh uh. Yup. I misread it. About 5 minutes in I realized my mistake and just said To Hell With It, I’ll make it as is and we’ll just have extra sauce. Oh, and we ate this over couscous with a side of roasted butternut squash. I cut the breasts in half…lame attempt at making them look like more in the pan. Salt and freshly ground black pepper **I mixed this into the flour instead of using it directly on the chicken. 1 1/2 lbs assorted wild mushrooms, such as porcini and cremini, stems removed and (1 1/2-inch) diced **I used two 10oz boxes of white/button. 2 cups Chicken stock, preferably homemade **I used No-Chicken Chicken Stock. 2- Pat the chicken dry with paper towels and sprinkle both sides liberally with salt and pepper (**I put s/p into the flour). Place 1/2 cup flour in a bowl and dredge the chicken in the flour. In a large (12-inch) ovenproof pot such as Le Creuset, heat the oil. 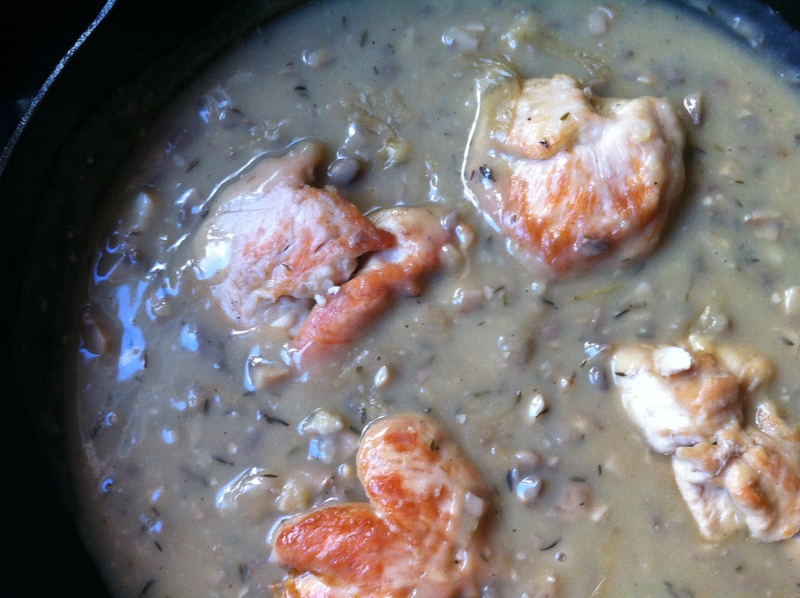 Add the chicken in three batches (don’t crowd them!) and brown lightly over medium-high heat for 3 to 5 minutes on each side. Remove the chicken to a plate and continue until all the chicken is browned. 3- Add the whole garlic cloves, mushrooms, and thyme to the pot and cook over medium heat for 5 minutes, stirring occasionally. Add the sherry and cook for 1 minute, scraping up the brown bits. Add the minced garlic and cook for 2 more minutes. Add the wine, chicken stock, 1 tablespoon salt, and 1 teaspoon pepper and bring to a simmer. Add the chicken (large pieces first), cover, and place in the middle of the oven for 30 to 35 minutes, until the chicken is cooked through (about 165 degrees on an instant-read thermometer). 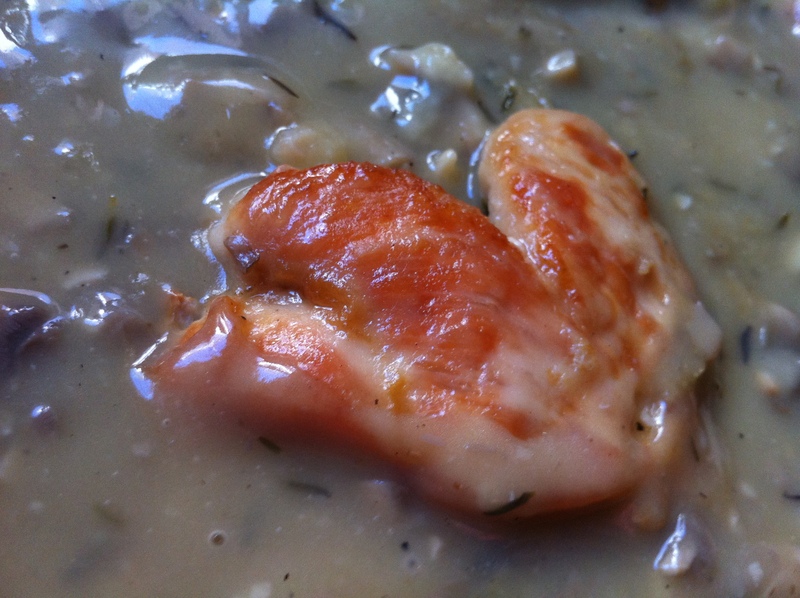 4- Remove the chicken to a bowl and discard the thyme. With a fork, mash together the butter and 1/4 cup flour and add it to the sauce. Simmer, stirring constantly, over medium heat for 5 minutes, until slightly thickened. Season to taste (it should be highly seasoned), put the chicken back in the sauce, and serve hot. **In the cookbook it says you can make this ahead of time. Do the whole recipe, let it cool, then cover and refrigerate. Reheat slowly over low heat until the chicken is heated through. That’s coucous in the background and roasted butternut squash on the side. 1 Butternut Squash **Today I used a 1 lb. squash. Teeny. 4 teaspoons Margarine **Feel free to use butter. 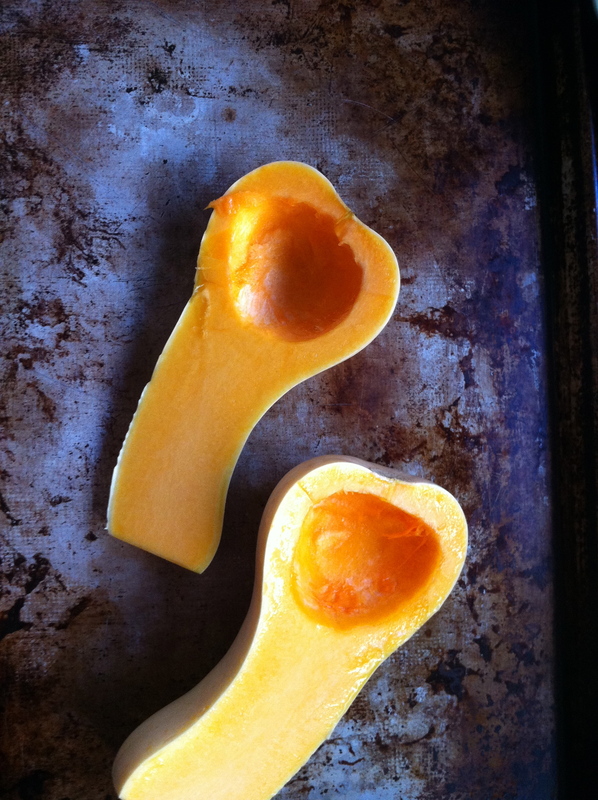 2- Using a big knife, slice your squash in half. Scoop out the seeds. 3- Lay the squash, cut sides up, on a baking sheet. 4- Whack it into the hot oven. Come back in 30 minutes and poke it. Is it done? No? Timer on for 15 minutes. Come back in 15 minutes. Done? No? Timer on for another 15 minutes. Done now? Ok. Great. Mash lightly with a fork. Add 2 teaspoons butter or margarine, let it melt just a bit and then mash into squash and serve! End Result: Pretty good, but not a keeper…C said that he thinks there are probably better recipes for this out there. I thought the sauce was too wine-y. It called for 2 cups, but probably would taste more to my liking with just one. Which is strange. I like drinking wine…wouldn’t it make sense to like eating it too?